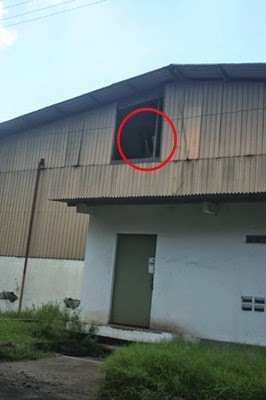 MostCreepy.com - An employee of a Textile company in Solo, Indonesia, managed to capture the moment the sighting of a scary ghost. The female ghost appeared with a long hair and wearing white clothes. According to the employee at the Textile Company, the photo was taken accidentally in a warehouse. The photo was taken to improve infrastructure at the company. It was really not in purpose to take a picture of the ghost. The ghost sighting photo in Solo was taken in the afternoon by using a digital camera. At first, they did not know that the photo contained a long-haired woman wearing white and white clothes. But after the photo was seen by someone else, it appeared the sighting of a long-haired female ghost displayed in the picture. And the news of female ghost sightings was immediately spread to employees at the company located in Solo.